Hello, now it's not normal to see me here on a Sunday however I wanted to drop in to let you know I'm writing over on Mrs Crafty B's Blog today. I'm sharing a couple of very simple Christmas decoration DIY's so please, please, please do pop on over to have a look and show some love, the direct link to my post is here. 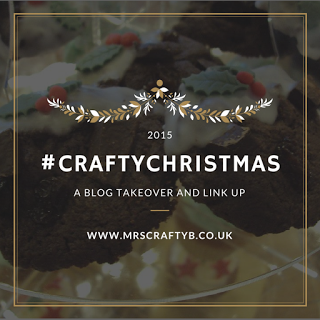 Mrs Crafty B has had a little Christmas craft takeover this week with a whole host of fellow bloggers sharing their Christmas DIY's so check out the posts published from earlier in the week too. I'd also like to take this opportunity to say thank you to Mrs Crafty B for having me on her blog, it's been an honour writing a piece for her. Great upcycle on that pud decoration. Glitter always makes things better! !